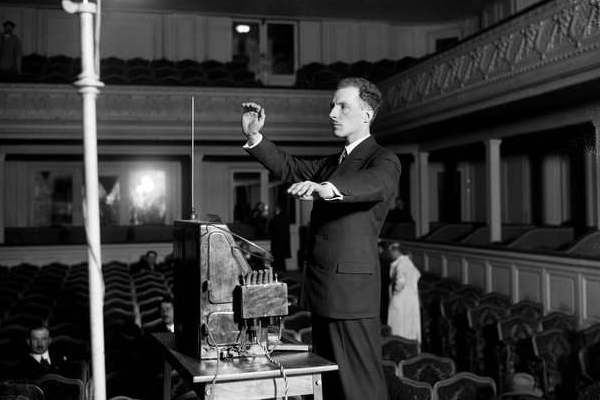 Терменвокс, Theremin (or Thereminvox) used to have a different name – “etherphone” – implying the way it works because sound seems to be produced with air. Theremin was the first electronic musical instrument in the world and was made by Russian (of French descent) physicist Lev Sergeyevitch Termen (known as Leon Theremin in USA) in 1919. In 1919 Abram Ioffe, a head of Leningrad Physico-Technical Institute, invited Lev Termen, a specialist in radio engineering, to cooperate. He was to be responsible for measuring the dielectric constant of gases at different pressures and temperatures. First Theremin’s measuring system was a generator of electrical oscillations based on the cathode tube. The test gas in the cavity between the metal plates is an element of the oscillating circuit and in fact it’s a capacitor that affects the frequency of electrical oscillations. While improving the sensitivity of the apparatus the idea of combining two generators came up and one of them would give a constant frequency oscillation. The signals from the two generators were fed to the cathode relay and at the output difference frequency signal was formed. The relative change in the difference frequency from the test gas parameters was much more considerable. Thus if the difference frequency fell within the audible range the signal could be heard. The ultra-sensitive device reacted instantly to insignificant changes in oscillatory circuit capacitance which depended on the hand position in respect to the antennas of the device thereby changing the frequency of the emitted sound. An “operator” shouldn’t be as perfect as a meter system but must surely have an ear for music – so at least to be a musician. The vertical antenna is responsible for the tone and the horizontal horseshoe-like one controls volume. A performer doesn’t have to touch the instrument with his hands so the hands can be fixed right (in oder to achieve the desired notes) only if you’ve got that flair for music. Electromagnetic waves were captured with the help of the receiver (resonator). It was all about the influence of an alternating electric field, current fluctuation and the amplitude of oscillation in a resonator. If the frequency of the receiver coincided with the frequency of electromagnetic waves then there was resonance. The instrument is good for many genres including classic, jazz and even pop music whether it’s for professional purpose or just for fun. It’ll do as an effect (bird singing, whistle and so on) generator as well for soundtrack making or theatrical performance, circus show. Lev Termen believed Rachmaninov’s “Vocalise” was the best demonstration of thereminvox capabilities. Great Soviet Encyclopedia says that Thereminvox can sound as a violin, cello, flute and other instruments the timbre of which is defined with the generator mode of operation. In November 1920 at Prof. Kirpichev mechanics meeting Termen performed for the first time. In March 1922 Lev Termen and A. Nikolaev, a radio council chairman, were invited to Kremlin by Lenin in order to show the innovative instrument. Termen performed Scriabin’s “Etude” and Saint-Saens’ “The Swan” then played Glinka’s “The Lark” together with Lenin and took an opportunity to promote his device – an alarm system – the operating principle of which has a lot in common with the system inside of a theremin. Lenin was hugely impressed with the value of Termen’s works and he wrote to Leon Trotsky asking whether it’s possible to reduce the number of Kremlin cadets in the guard if they introduce electric alarm system. He wrote that he met Termen, an engineer, who demonstrated them his “experiments”. As a result despite that difficult time Russia was going through the decree on physical-technical department (of State Radiology Institute) creation was signed and the inventor pursued his studies there. There are several theremin types the structures of which are different. Today there are ones which are produced in series and unique ones as well, there are also special schools where they teach you how to play theremin. The first models created by Termen himself featured two antennas: the left hand controlled the volume, the right hand – the pitch; but modern theremins offer another method: pitch is still controlled with the right hand but the left one controls general sound parameters with the help of a button-filled “manipulator”, and the volume is adjusted with a pedal. Konstantin Kovalsky was the first official performer who mastered this instrument (second type of theremins). Lev Korolev introduced the number of fundamentally new solutions and improvements thanks to which the theremin became much more suitable for use. There appeared a spatial fingerboard visualizer: a scale showing sound pitch corresponding to the hand position. This allows to find the note much easier than with previous theremin models which is really important in the beginning of the composition or when playing with an ensemble. The stability of Korolev’s model didn’t depend on humidity anymore so the pitch neither shifted nor floated. There was also a scale length alignment added and timbre set enlarged. The classic theremin type is that first “aristocratic” model made by Termen himself. The sound is controlled with free hand movements within the electromagnetic field around these two metal antennas. A performer should be standing while he’s playing. Pitch changes happen with a movement of a hand which is approaching the right antenna while volume changes with the left hand reaching out to the left antenna. This very model became so popular with the people from all over the world. Theremin is for sure a unique instrument. There are companies which specialize in theremin production. There were a few concert models created: one for Clara Rockmore – a protege and one of the first Termen’s students – and one for Lucie Rosen in USA. These models got the biggest response from the world. In Russia Lev Termen constructed a few concert models for his daughter Natalia Termen. Lydia Kavina is another renowned theremin expert as well as Termen’s relative. Lydia Kavina and a German performer Barbara Buchholz formed an international project together – it was called Touch! Don’t Touch! and appeared in 2006. 4 Russian and 5 German composers were making contemporary kind of music using theremin. Two instruments were created to be kept in museums: Polytechnic Museum and Central Museum of Musical Culture, Moscow. Modified theremins are the instruments which underwent some elaboration. For example, “Etherwave” theremin, designed by Robert Moog, is kind of a theremin kit because you can easily build your own Etherwave having all the needed details. And you don’t have to be an electronic geek to do that. Even more, “Moog Music” sold assembled Etherwave instruments (several modifications). The circuit board is factory-assembled and you also get nickel-plated antennas, wooden panels and an external power supply. Theremin made by Paia company is another “theremin constructor”, a controller for analog synthesizers. Theremin “T-vox tour” developed by Grigoriy Pavlov, the husband of a Russian theremin performer Lydia Kavina, was produced in limited series. The instrument has its peculiar timbre and an 8-octave range. T-VOX was one of the instruments Barbara Buchholz, Lydia Kavina, Olesya Rostovskaya and Anastasia Lopatina would use in their performances. “Classic” theremin created by Andrei Smirnov was constructed as a traditional theremin. Owing to modern electronic components the instrument appeares to be quite light-weighted, truly reliable and smoothly functioning, solid and enduring. The original circuitry maintaining the classic design allowed to achieve staccato and quick dynamic. The instrument has an effective 6-octave range and provides an even timbre adjustment. In Konstantin Kovalsky’s theremin system (he was the first Lev Termen’s assistant) pitch is still managed with the right hand while the left one controls general sound parameters using that button-filled “manipulator” we’ve already mentioned; a performer is to play while he’s sitting. Konstantin Kovalsky (1890-1976) was a master at playing this kind of a theremin. This model wasn’t as popular as a classic one, anyway the tradition keeps on going thanks to Kovalsky’s students and colleagues – Lev Korolev and Zinaida Dugina-Ranevskaya who created their own school in Moscow. Lev Korolev (1930-2012), a constructor, was developing and improving these kind of theremins during long years. He also built an instrument called “Tershumfon” (shum = noise) the expressive sound of which was a narrowband noise, plus he added a visualizer – an optical indicator of the note playing at the moment. Olga Milanich, Peter Termen used to perform with it. This model wasn’t as widely famous as the classic one. There are also virtual theremins – thereminvox application alternatives which you can find for your smartphone or tablet, i.e. anything featuring a touchscreen. “SunVox” software of Alexander Zolotov, a Russian programmer, offers this function as an extra one for a quick filter test (you can easily get 5 or 8 octaves appearing on your display) or for other frequency-dependent elements of the instruments you might enter. But you can’t use this instrument in the track composed in “SunVox”. The virtual theremin is sort of a coordinate graph and you can produce sounds with a move of your finger or a stylus. And that’s what you do with a real and original theremin: while moving horizontally you’ll be changing the pitch, a vertical move will change its volume – reminds of the initial operating principle. And it’s not just for fun, if you apply the soft using a tablet with a high resolution display you can “break” the screen into 1 or 2 octaves, you can play vocal parts, use vibrato (frequency and amplitude oscillations) which actually is a key ingredient of a real theremin for expressive sound. Two types of vibrato can be created quite in a simple way – by continuous circumferential movements with a stylus. “SunVox” can be used this way thanks to formant filters. And of course you may (and should) record the output.